Bulle pontificale « Pour le gouvernement de l'Eglise régulière ». As the Aristotelian message is at the same time one, as issued by God, and dual as transmitted by Aristotle and Christos, in the same way the Church presents a single aspect, as the holder of the True Faith, and at the same time a dual one since it is constituted by both regular and secular clergymen. These two components are the two aspects of the same reality: the Church. Regular clergy, according to Saint Benoit of Pisa Yaolo, spiritual Patron of Monachism and Guardian of the Tablet of Oane, is composed of faithful ones willing to live in a community so that they may develop the message of the prophets and otherwise work for its preservation/diffusion, its propagation and the general welfare. The Religious Military Orders (OMR), host the soldiers of the Church and often have a distinct religious wing in them. Their relation with Rome, and in particular the sanctioning of their statute and their Canon, concerns the Congregation of the Holy Armies. It is customary for members of one type of order to participate in orders of the other type. Each Order consists of a monastic community. Every Order has its own charter by which its members take their oaths; this charter is often inspired by the Canon of St. Benoit. This latter, father of all the Aristotelian Charters, underlines the importance of the oath of obedience, as well as of charity, humility and chastity. Abbeys, monasteries, priories and convents are places of work, spirituality, meditation, theology studies and prayer, where regular clergymen live in a community; they offer a home to the believers in retreat. There is a certain hierarchy in the abbeys, the monasteries and the convents. Some of them are the seat of their Order as a whole (and in such a case they’re called “mother”) or of a branch of it. These halls of faith are no way different from the ordinary abbeys, monasteries and convents (called “daughters”) but for the existence of a Chapitarian having authority over the rest of the abbeys, monasteries or convents of the order or the branch. The construction of such places always requires the authorization of the metropolitan archbishop of the archdiocese concerned. Material cause: they have to be a priest at the time of their nomination. This clause does not apply to those religious orders that have not yet adopted it; however, it does apply to the next nomination of their rector. Efficient cause: they have to be nominated according to the rules of the Order. Formal cause : They have to be appointed according to the rules of the Order after being officially accepted by the Congregation diffusion de la foi. Final cause : the Rector is the highest Church authority in a religious Order. He is canonically considered as equal to a bishop by the members of his Order, who constitute a fictitious diocese, as regards all sacramental practices. He/she rightfully participates at the Episcopal Assembly of his residence. He may continue his extra muros activities as long as he maintains a strong bond with his intra muros life. Material cause: they have to be a priest at the time of his/her nomination. Formal cause: hey have to be appointed according to the rules of the Order after being officially accepted by the Congregation diffusion de la foi for the RMO. Final cause: they are the right hand of the Rector in the ORR in all matters and in charge of all religious, ritual and sacramental matters pertaining to the RMO. According to the Canon, they have, as regards the members of their Order, the power, the authority and the faculties issuing from a fictitious diocese of a Rector. They may continue their extra muros activities as long as he maintains a strong bond with his intra muros life. Material cause: they have to be a believer, a clergyman or a priest at the time of their nomination according to the specific needs of each Order. Formal cause: they have to be appointed according to the rules of the Order. Final cause: their field of action and authority depends on the rules of each Order, but their seat is the General Chapter of the Order, and they actunder the authority and in coordination with the Rector or the Great Master. They may continue their extra muros activities as long as theymaintain a strong bond with their intra muros life. Material cause: they have to be a priest at the time of his nomination. Efficient cause: they have to be nominated according to the rules of an ORP concerning the abbey Res Parendo. Formal cause: they depend on the standing internal rules. Final cause: they are the higher authority of a Res Parendo abbey. They may continue their extra muros activities as long as they maintain a strong bond with their intra muros life. Efficient cause: they have to be nominated according to the rules of the Order to help a Superior Father or the Great Prior. Final cause: they have the duty to encourage all religious, ritual and sacramental matters in coordination with their superior; either Superior Father or Great Prior, they being the second official. They may continue their extra muros activities as long as they maintain a strong bond with their intra muros life. Material cause: an ordained conventual. Competency requirements: a prelate who ordained the conventual. Formal cause: ordainment by a qualified prelate. Final cause: The extra muros exercise of secular religious duties, presupposing an ordainment, can be possible as long as he/she continues to participate as much as possible in the communal life and its obligations intra muros as a regular conventual. Material cause: a believer willing to serve the Church and God within a religious or military-religious Order. Efficient cause: they have to be accepted according to the rules of the Order. Formal cause: the rite of taking the conventual oaths in order to live in monastic austerity. He/she takes the oaths of obedience, charity,humility, pacifism (no arms) and chastity. Final cause: Accession to the status of regular clergyman. They commit themselves to give proof of spirituality, to be dedicated primarily to God and to live in communion with a Res Parendo community controlled by an acknowledged religious Order. They may continuetheir extra muros activities as long as they maintain a strong bond with their intra muros life. Material cause: a believer of the Church who is willing to work inside an Order and, while taking minor oaths, remains active in secular life. Efficient cause: they are to be accepted according to the rules of the Order. Formal cause: the rite of appointment and the pronunciation of minor oaths. Final cause: the oblate status is a lay status and doesn’t imply more than the minor oaths of obedience and charity. An oblate can carry arms, get married and start a family. It is up to the discretion of the various orders to accept or not this status. Material cause: they have to be a clergyman subjected to the Canon and the hierarchy of the Holy Church. His candidacy has to be approved by the (arch)bishop of the diocese where the In Gratibus abbey belongs, or by its senior. Efficient cause: they are elected by the monks of the In Gratibus abbey. Formal cause: they have to be appointed by the appropriate (arch)bishop. Final cause : they are the higher authority of an In Gratibus abbey respecting the dogma, the Canon and the Roman hierarchy. They are obliged to live permanently in the abbey and, on diocesan level, they are totally equal to a clergyman, as regards even the submission to the power of the bishop who is responsible for the In Gratibus parish. Material cause: any believer wishing to serve the Church and God and to draw away from secular life in an In Gratibus abbey. Efficient cause: they are nominated by the (arch)bishop of the diocese where the In Gratibus abbey belongs. Formal cause: they help the abbot in charge in all religious, ritual and sacramental matters Res Parendo. Final cause: they represent the Episcopal power in the abbey and they are number 2 of the abbey; they rightfully participate in the Chapter and the restricted internal council. Material cause: Every believer wishing to serve the Church and God and to draw away from secular life in an In Gratibus abbey. Efficient cause: they are accepted according to the In Gratibus rules. Formal cause: The rite of appointment performed by the Abbot. They pronounce the oaths of obedience, charity, humility, pacifism (no arms) and chastity. Final cause: Accession to the status of a regular clergyman. They commit themselves to give proof of spirituality, to be dedicated primarily to God and to work in communion with the members of the In Gratibus abbey. They are to respect the dogma, the Canon and the Roman hierarchy. The certificate of the Congregation diffusion de la foi is a necessary requirement for the acknowledgment of an Order, the foundation of an abbey or any other similar building, as well as for the appointment in certain offices. It is under the authority of the Roman Regular Chapter pertaining to the above mentioned Congregation. The Aristotelian label can be obtained by an organisation (moral person), a believer (physical person) or a building dedicated to a regular monastic use. This accreditation concerns all the validations that must be confirmed by the congrecation diffusion de la foi in virtue of the Canon or the present text so that access to a specific office is allowed. The believer has to deposit his complete dossier to the CDF. - a Curriculum Vitae completed by a letter concerning his motives and his plans in the office he aspires to. - the patronage of two clerks of the Church, of whom one at least has to be an (arch)bishop. In any case, it is recommended that one of his patrons be the priest of his parish or the bishop of the diocese of his place of origin. - An oath to the Aristotelian Church and the Pope is required. The above mentioned oath must be taken before a representative of the Regular Roman Chapter during the procedure of labelling. The acceptance of the CDF validation implies the commitment by such an oath to the Aristotelian Church. I (NAME) take an oath before Aristotle and by the Holy Scriptures to act always and primarily in the interest of the Aristotelian, Apostolic and Roman Church. I (NAME), commit myself to pronounce the oaths and/or accept the Canon obligations proceeding from the office that is to be accredited. I (NAME), accept to be subjected to the Aristotelian triple obedience: obedience to the hierarchy established by Christos, the obedience to the dogmas, the obedience to the Canon. 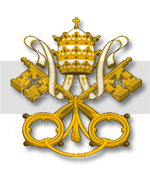 I, (NAME), take an oath before Christos and by the Holy Scriptures to always and primarily serve the Pope and his representatives. Likewise, I recognise all my other allegiances, deferences and obligations as subjected to this oath. I (NAME) take an oath before Arnvald and by the Holy Scriptures to respect this oath to the day I die or to the day I will be canonically relieved of it. A member of the Regular Roman Chapter will attend to verify that all the above conditions are fulfilled. He may request and collect the testimonies that he requires necessary. He will then compose a report to the CDF, while the final decision depends on the chancellor after the consulting vote of the Regular Roman Chapter. The conclusion of the labelling is a Res Parendo religious ceremony on the model of appointment to a Roman clerical office. This accreditation concerns groups having religious or secular activities and wishing to obtain the rights and obligations pertaining to the Aristotelian label. For the secular groups, it is a definite stage, but for a postulant of the ORR status, it is just a preliminary acknowledgement. This phase is a period during which the postulant Order will be judged and tested for its good faith, the profoundness of its engagement and its members. This procedure of labelling can also concern the religious wing of a postulant having the status of OMR. - the appointment in an accredited parish of an accredited clergyman according to the rules of the CDF. A member of the Regular Roman Chapter will attend to verify that all the above conditions are fulfilled. He may thus have full access to the interior of the postulant group. Likewise, all the members of the group have to give sincere and straight answers. He will then compose a report to the CDF, while the final decision depends on the chancellor after the consulting vote of the Regular Roman Chapter. - the completed process of labelling for two future administrators of this building. A member of the Regular Roman Chapter will attend to verify that all the above conditions are fulfilled. He will then compose a report to the CDF, while the final decision depends on the chancellor after the consulting vote of the Regular Roman Chapter. The procedure of acknowledgment specifically for the postulants ORR is just a beginning. The labelling is just a preliminary acknowledgement. This phase is a period during which the postulant Order will be will be judged and tested for its good faith, the profoundness of its engagement and of its members. This period can be very long and there are no set maximum limits. On the other hand, the minimum limit is set to four months of repeated and justified engagements of a total duration proportional to the life of the Order. It has to participate as much as possible in the life of the Church in the congregations of Rome and in the secular clergy of the dioceses. It will also try to collaborate and coordinate with its homologous ORR in every common religious, ritual and sacramental activity. - that the Order assures a religious formation of its members during a period of noviciate before their definite acceptance in the Order. The Roman Regular Chapter is to assure that all these conditions are fulfilled. So, it will have complete access to the domain of the postulant group. Likewise, all the members of the group have to give sincere and straight answers. The RRC will then compose a report to the Curia for the final decision. The RRC is the apostolic institution affiliated to the Congregation diffusion de la foi. It has the duty of supervising the actions of the regular clergy; it functions as a link between the various Aristotelian Orders and it also permits the organisation and the coordination of all religious, ritual and sacramental common activities. It has also the duty to deliver certain accreditations as described in this text. The above mentioned Chapter is presided over by the Chancellor of the Congregation diffusion de la foi or by the clergyman appointed by the aforesaid Chancellor. The Rectors of the ORR and the Grand Priests of the OMR and one representative duly acknowledged according to the standing rules of the concerned Order are also full right members of the RRC. Other entries can be proposed by anyone of the members, while their definite nomination pertains to the Chancellor, who also has the right of veto.